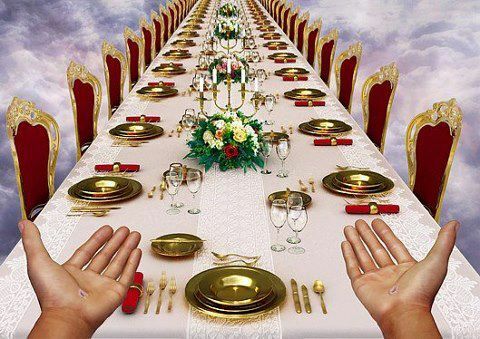 Come and feast at My banquet table that is spread with all kinds of delightful things, says the Lord. You are invited to come and dine! You have the keys to My kingdom, and My table that is in My presence is spread for you. Come and eat and drink. Be filled with all that I have prepared for you! There are no missing elements on My table. Healing is on the table, for it is the bread of life that I have for you. The hidden manna is there that will satisfy every need that you have. There is no cost. I bought and paid for everything that you need by My shed blood and finished work on the cross for you. I freely give you all things that pertain to life. I Am life; I give you abundant life, and daily load you with benefits, says the Lord. You do not have to eat of the crumbs that are under the table, so do not crawl. Come boldly, empty and that you may be filled, says the Lord. Stand up straight and tall, for you are MY CHILD: My beloved child. I have made you royalty! Come and enjoy what I have for you that will satisfy every hunger, every thirst. Come hungry and thirsty to My table, says the Lord, for you will not be disappointed and you will not go away hungry. You will be completely satisfied, for My blessings upon your life make you rich, and I add no sorrow to them. I will satisfy you with the longing of your soul and you will be fat and full of My unimpeachable blessings. Joy is there, and all that you need will be supplied. Joy and gladness await you, and I will fulfill the desires of your heart as you press into My presence, come to My table and receive of all that I have prepared for you freely, says the Lord.